It’s the first thing you touch and the last thing you would remember when typing on it. Yep, keycaps. All this time you’ve focused on those switches or keyboard, but never paid any attention to the keycap and why should you? Well, you’ll be surprised how much difference there is and how that piece of plastic can influence your typing experience. Beyond the experience, there are many factors that influence the overall quality of the keycap, such as the coating, legends, and plastic. All important factors we like to keep in mind for the Wooting mechanical keyboard. The most talked differences are the type of plastic; ABS and PBT. In general, PBT is seen as superior over ABS keycaps, because it’s stiffer, durable (just don’t hit it with a hammer), stays true in color and doesn’t develop a shine effect over time. Take a look at your keyboard, most likely you’ll find some glossy keys. Source: Geekhack. The shine effect. You’ll also find during typing that the sound between ABS and PBT are significantly different. PBT will sound a bit more “thumpy” or lower toned and ABS a bit more “clicky” or higher toned. There is also POM and PC plastic, but these are less common. POM- is a quality grade higher than PBT keycap, but also considerably more expensive and therefore very uncommon. 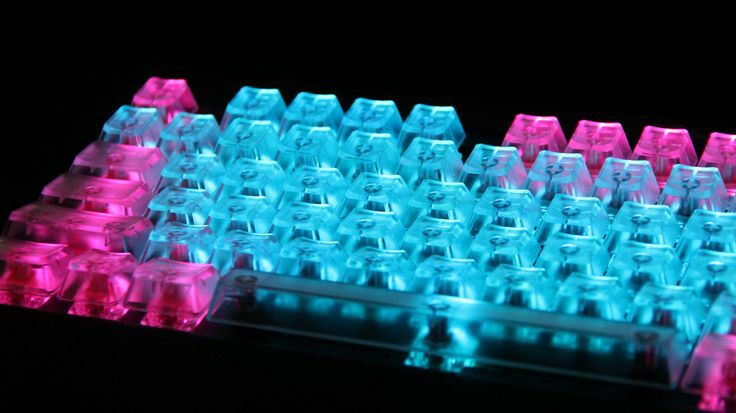 PC is a tough clear plastic used for translucent keycaps, popularized by Signature Plastics. Oh, forgot one! 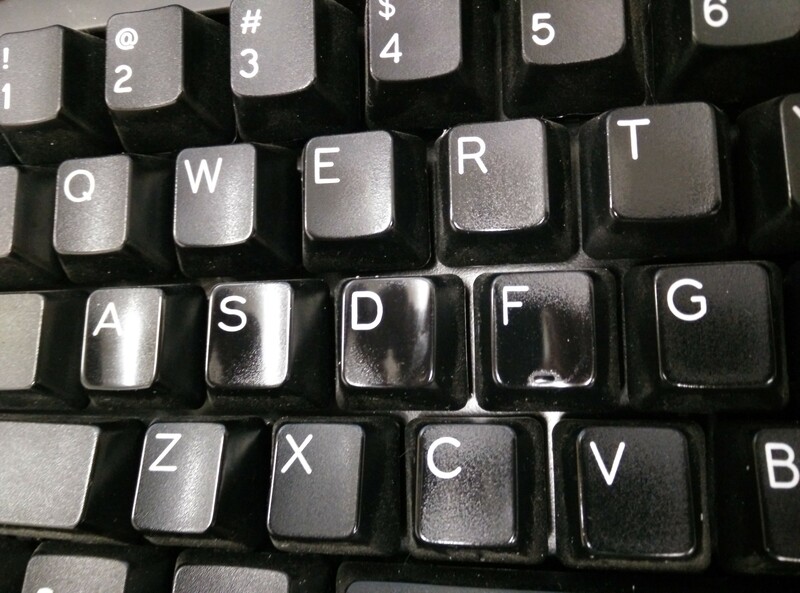 PVC; probably the least favorable but after ABS, the most common keycap plastic found on inexpensive keyboards. The characteristics are quite similar to ABS but more sensitive to heat. It’s scrutinized for its environmental impact, so boo! 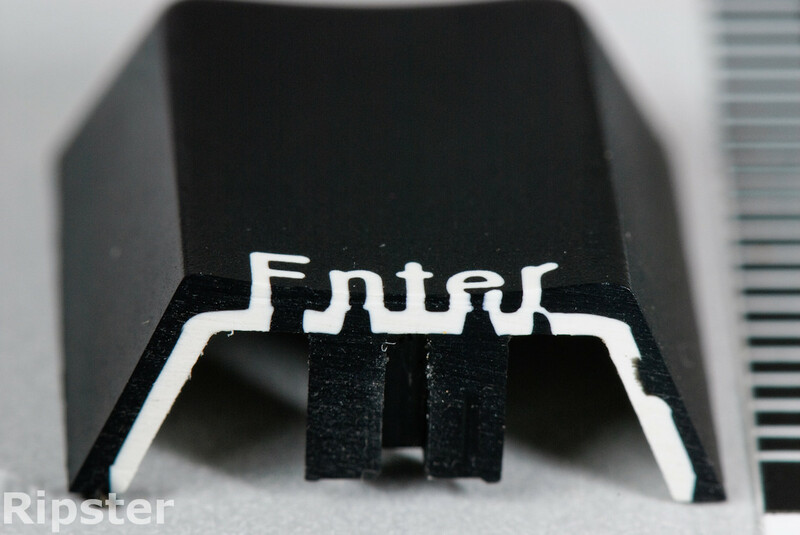 You can also find out what your keyboard keycap is made of, by yourself. You might ask, who cares? Well, once you realize how much time and keypresses you input on a daily base, especially in this tech savvy time, you’ll start to get more picky, or you just get addicted to the mechanical keyboard hobby and start hoarding for moar. Back to business, we can conclude that most keycaps are made by either ABS or PBT, but other than the plastic type, the manufacturing process is just as important. A keycap is often made by a single- or double injection molding process. The latter is only used for what is called “double-shot” keycaps. Double shot keycaps are made from 2 layers of plastics, most commonly ABS. The first layer is usually molded for the legend (the graphic on the keycap), followed by the second mold injection for the keycap hull, thus “double-shot”. For each printing method, the quality is very dependent on the manufacturer, but will never last longer than double-shot keycaps. Pad printing is by far the most popular method for nearly all inexpensive keyboard. 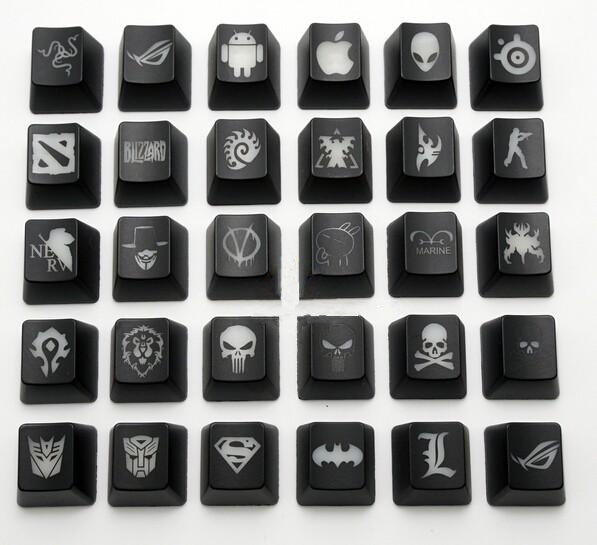 There are different pad printing methods, but basically it literally prints the legends on the keycaps. Sublimated dying infuses the ink with the plastic through a heat press process. It’s best used with PBT to prevent the plastic from wearing too fast, as the ink sinks in very shallow. It’s very similar to how they make those cute custom family picture mugs, ahww. Laser printing is after pad printing a very popular method. Especially with the increasing demand for backlit keycaps. There are 3 common methods of laser printing. 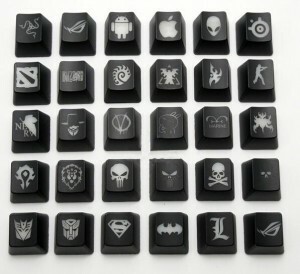 Laser etching basically burns into the plastic, leaving black charcoal colored legend on the keycap. It’s commonly used on white keycaps for contrast. Laser etching with paint fill is identical to laser etching, but afterward the engravings are filled with colored paint. Very useful on black keycaps. Laser engraving is commonly used to make backlit keycaps. A transparent keycap is coated with a black UV paint mixture, after which a laser removes the paint in the desired legend. The illumination of the keyboards will shine through the transparent keycap wherever the paint was removed. The process looks quite wicked. Source: Alibaba express vendor. Everything can be engraved with a laser. Backlit keys are also possible to make with double-shot keycaps by using a transparent plastic for the legends. The illumination is in comparison slightly less due to the thick plastic, but the durability is, of course, sublime. The last thing to notice about the build quality is the UV coating applied on the keycap, often at the very end. 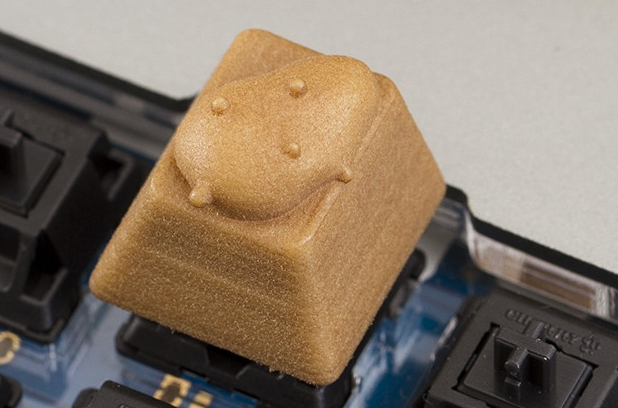 Depending on the manufacture, the coating can significantly increase durability and change the “feel” of the keycap. Other than that it prevents “yellowing” from sun exposure, just like those dirty old looking advertisement or menu banner at snackbars. If you want to go even further “into the keycap”, then you should check out this in-depth analysis by Ripster55. So what makes the best type of keycap? Well, that kind of also depends on yourself. Any type double-shot keycaps is a very good start, but these are quite limited in availability. The same counts for PBT keycaps, but you can occasionally check out Massdrop for keycap “drops”, they usually have some special keycap deals running. Alternatively, you can just get it straight from the source, and import it from Taiwan or China. When you really get into keycaps you can also opt to make you own 3D printed version or buy unique artisan keycaps, the choice is yours. Wait, hold on a second! There are 3 last important (pesky) things to notice. Not every keycap fits on every keyboard. You have to take good notice what switch you’re using because the keycap female stem has to fit with the switch male stem. Most keycaps are made for Cherry MX switch, which use the same + shaped stem, just like the alternative Gateron and Kailh switch. In most cases, you have to take extra care when searching for less common Alps or Topre switch keycaps that have a different type of stem. That being the case, many people fall for the non-standard bottom row trap. The entire bottom row, where the spacebar is found, can differ in size. When the bottom row is different in size, either the “windows” (aka META) key or spacebar is different from standard. You can notice the former immediately if the CTRL, META, and ALT key don’t have the same size. The spacebar is a bit trickier to notice, but if any of the other keys are smaller than usual, the spacebar is also different. Just make sure to do the math and check if you have an ANSI or ISO layout keyboard. We’re not done just yet, there is a 3rd thing, namely the key profile. Keycaps can differ in height and shape, based on the entire keycaps profile. A very familiar one is the chiclet profile, all laptops have it; entire flat keycaps. On a mechanical keyboard, the most popular profile is contoured. That’s a bunch of information you have to process, so take another sip of your coffee, enjoy the following keycap. Very helpful and thorough, thank you! Looking for my first mechanical keyboard and you kinda confirmed my choice (Ducky One TKL, an RGB backlit keyboard with PCB doubleshot keycaps and MX Brown switches). Cheers! post is siumply spectacular aand i can assume you’re an expert on this subject. post. Thanks a million and please keep upp the enjoyable work. Thanks for posting such an informative article. It’s to the point and chock-full of content. I feel like I went from noob to expert in a few minutes. You’re awesome. Have a great year! Awesome resource on mechanical keyboard keyboard keycaps. I want to ask that is it worth getting a PBT keycap keyboard over ABS for extra price? Most definitely yes. PBT keycaps are often the way to go over ABS. Only things you have to consider is design and style, what fits your keyboard best. ABS keycaps will work just fine, but when it comes to long-long use, your best bet is with PBT. In my personal opinion, the only type of ABS that’s worth considering after-market is double-shot. Unless it’s low priced and the design is nice. I need a keyboard with the number pad on the left side since it was never EVER meant to be on the right – whoever did that was just an abuser who hated users. I also need keycaps not made from CHEAP plastic which can’t take side sheer forces from damaged fingers which can not strick ‘straight on or in the middle’ but sideways from any side that that finger still can navigate. Most keys are way too close… again it’s so much easier to move a bit than it is to overstrike keys that are knotted, swollen and painful. I hit two keys most of the time when I am typing even through I used to be able to type without a single error.